After several days of bad publicity, the city’s arena JPA finally responded to the criticism with a letter to the Journal Star yesterday. Although given that the three JPA members aren’t legally allowed to meet privately — because it’s a violation of their bylaws — I’m not sure how they got together to write the letter. Perhaps someone wrote it for them? Let’s get into the meat of the issue: As I’ve written before, the arena JPA has taken a troubling turn lately, allowing its general contractor, Mortenson Construction of Minnesota, to skip using the city’s purchasing process to choose most of its subcontractors. Mortenson has argued that it needs to have this flexibility to get the project done on time and under budget. Problem is, they’re not doing it the way the city specified when it solicited bids from companies nationwide. Trivial, I know. Unless you’re one of the other bidders. Now the JPA (that’s Mayor Chris Beutler, Councilwoman Jayne Snyder and Nebraska Regent Tim Clare) is defending its decision to go ahead and approve the pre-construction contract, despite its less-than-transparent features. They argued in their letter that the city’s electronic bidding process (e-bid) wouldn’t allow Mortenson to steer contracts to Lincoln businesses, because they would have to take the lowest bid. Not so: It’s not the e-bid computer system that prohibits them from playing favorites for local companies — it’s the city charter. However, the city doesn’t have to take the low bid if the company doesn’t meet specifications — and those specifications can include all the “important factors” (like their safety record or experience) the JPA said Mortenson needed to be able to evaluate in choosing subcontractors. They also said e-bid wouldn’t allow Mortenson to force subs to “sharpen their pencils” to find additional savings after bids are submitted — but that also opens the door to wheeling and dealing with their preferred sub to make sure they get the job. The JPA did acknowledge the validity of “the concern about transparency” — but claimed the amendments they adopted would bring some transparency to the process. However, seeing scorecards and names of bidders does not eliminate the fact that the public STILL WILL NOT BE ABLE TO SEE THE ACTUAL BIDS. This kind of secrecy and shrouding got Mortenson in trouble in Kentucky, and it may just get them crossways with contractors here, too, if the JPA continues to allow Mortenson to run roughshod. The doling out of arena subcontracts may not be as open and transparent as originally advertised if the Joint Public Agency that governs the arena approves the pre-construction agreement on its agenda Wednesday. Mortenson Construction of Minnesota and Hampton Enterprises of Lincoln are construction manager at-risk for the arena project, and the way they handle awarding of contracts is of great interest to companies hoping for a piece of the $340 million project. However, the agreement (see it here: JPA-Attach-01-26-11 the agreement begins on about page 140) does not require Mortenson to follow the city’s usual open, transparent bidding process and hands over construction of two more projects that weren’t in the original project scope — a pedestrian bridge and arena plaza — to Mortenson rather than put them out for bid to give other companies a shot at them. The mayor’s office responded to that, saying “The beginning and ending points for projects are hard to define, especially when it pertains to a bridge. The JPA has looked at the arena block and has generally assumed that the arena block would be built by Mortenson” and would avoid putting multiple general contractors in a “tiny area.” The bridge will land on the arena block, the mayor’s office said, and the JPA already has an agreement that Mortenson will carry a $25 million liability policy. “When swinging stuff over active tracks it is in the best interest of the taxpayers to delegate the bridge responsibilities and liabilities, over to Mortenson, given its proximity to active railroad tracks,” the mayor’s press statement said. 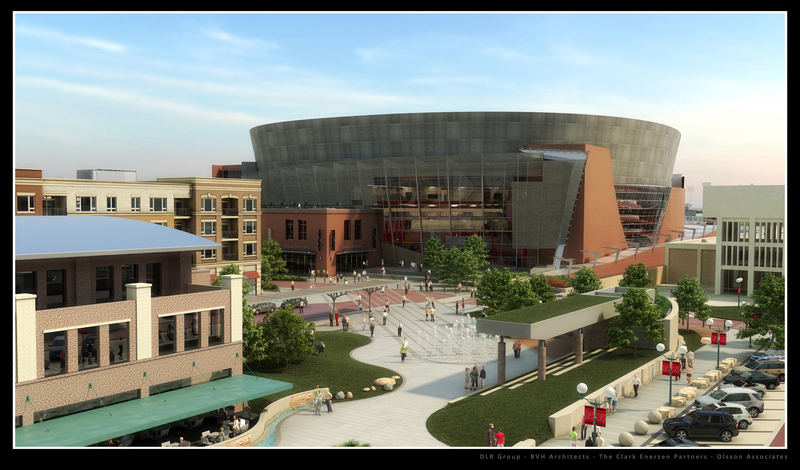 Same goes for the civic square on the arena doorstep — the mayor’s office said that will be done by Mortenson. The statement didn’t address why neither the pedestrian bridge nor the civic plaza was mentioned in the original scope of service, but are now being added to Mortenson’s job. Although the city had advertised for a company that would use the city’s bid process to choose subcontractors, the propposed agreement would allow Mortenson to choose subcontractors to do mechanical electrical and plumbing, structural steel, precast concrete, concrete, exterior walls and vertical transportation — which seems like a big chunk of the work. It appears Mortenson will handle everything except the “receiving” of the bids through the city’s eBid system. But then the proposals will be opened privately — which caused Mortenson some trouble in Kentucky. All of this will be done before Mortenson comes up with its guaranteed maximum price — which it must calculate when 60 percent of the arena design is done. In other words, this is the way Mortenson wants to do it, the way they usually do it, in order to keep their promise to come in on, or under, budget. Mayor Chris Beutler has long promised this project will be open, transparent and fair — but lately, city officials have been backing away from that open and transparent stuff, because it doesn’t seem to fit with Mortenson’s way of doing things. Jim Martin, hired as program manager to coordinate all aspects of the local arena design and construction, has voiced concerns about using the city’s e-bid system, said Dan Marvin, who represents the city on the arena team. The city’s e-bid system requires the purchasing department to explain why it is not taking the lowest bid. That process also allows the public to view bids electronically just minutes after they are opened. Too many restrictions may hurt the Mortenson-Hampton team’s efforts to get the project done on time and under the guaranteed price, Marvin said. You can almost picture Marvin backing away, can’t you?